Progressive Jackpots offer the largest most impressive cash prizes that has potential to reach into the millions. The accumulative cash amount is generally connected to other Casinos and continues to grow when a percentage of all wagers placed go into a single prize pool. To win, players for the most part must wager a max bet to qualify and match the required symbols across the reels for Slots or a certain winning hand for Table Games. There are also other types of Progressive Jackpots that are 'Random'. 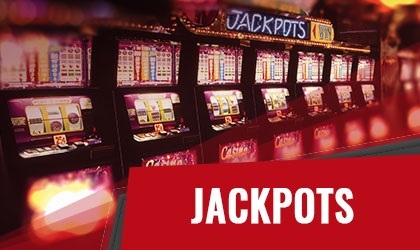 Random Jackpots do not require a winning combination or a set bet to win and is randomly awarded to a single player. Slot Jackpots are programmed into every machine and is achieved when matching the highest paying symbol across all reels. The amount won varies depending on the size of the bet and machine type including Video Slots and traditional Classic Slots. All online Casinos include Slots Jackpots however, other forms of gaming offering Jackpots vary from one Casino to the next. Hitting a smaller Jackpot is far more possible offering better odds then winning a life changing Progressive. The thrill of winning big money in an instant while playing in the comfort of your home is not only exciting but a great opportunity to fatten your bank account. Below is a list of online Casinos and software for Progressive Jackpots games with their current real time value, average win, last payout and highest peak. Browse through the list and with a whole lot of luck you could be the next Progressive Jackpot winner, after all someone has to win it!